This article, published February 3, 1907 in the Indianapolis Star discusses the formation of a consortium to create a closed-loop, paved speedway on Long Island in New York. The plans at the time were were extremely vague so observers including the media made a lot of assumptions. The key one was that the course would be paved and that it would be entirely private without any public roads being used for auto racing competition. 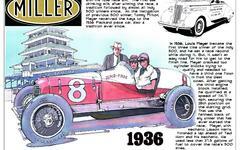 Arthur Rayner Pardington was one of the powerful pioneers who shaped the sport of auto racing in the early 1900's. He was William K. Vanderbilt Jr.'s right hand man in most of the millionaire's race organizing ventures as well as the Long Island Motor Parkway.